PLANET in PERIL, your "one-stop shop" for the truth about our planetary crisis. : Rhetoric vs. Reality. A Tale of Self-Deception. It is a common human trait to embrace nature - or at least the notion of nature - in our everyday pop culture and in the ways we portray our civilization to others. Animals abound in TV and print commercials as they obviously strike a chord within the customers who buy the "stuff" being advertised. Not a strong enough chord, however, for us to actually preserve the habitat they need for their survival; and that you and I may well need for our own emotional wellbeing. Below is just a small example of what I mean - one that has played out in my own "neck-of-the-woods," in Manitoba, Canada; an almost schizophrenic contrast between the images we like to publicly portray, compared to the reality. The rhetoric. 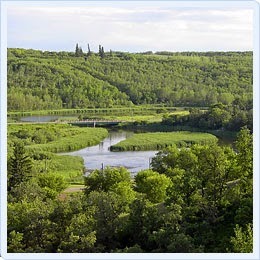 The bucolic image above appears on the website of the Town and Municipality of Birtle (in west-central Manitoba) as the "beautiful Birdtail River Valley." The website reminds us the Municipality has been recognized for its "environmental awareness." An excerpt from a history book of the Birtle area is revealing. And that was almost thirty years ago! Obviously, the disappearance of wild land documented by the Association has done little but accelerate since. So is this, in and of itself, surprising? Maybe not. What is surprising is the degree of denial we continue to bring to the reality of vanishing nature and its replacement with the less-than-attractive images which are often justified using weasle-words such as "progress" and "opportunity."